Damart, possibly the smelliest underwear ever invented. At the time, though, it was the best sythetic base layer available. I walked the Pennine Way in a Damart t-shirt in 1978. I also had one of the first commercially available GoreTex jackets from Mountain Equipment. By the end of the walk it was destroyed. The material blistered and I had to exchange it for a new one! We are spoilt now. I once came across a website about Scotland's toughest hill. This website, which I can't find anymore, referred to a list and booklet that, I think, Hamish Brown wrote. The tables in this booklet apparently referred to some 6000 bumps in Scotland and listed each not only in their height, but also listed how much calories one would use to get to each particular bump from the nearest logical access point. Ever since I'd be keen on getting hold of this booklet. Are you familiar with it and could you provide title or ISBN number of this booklet? On the Pennine Way in 1976 and Land's End to John O'Groats in 1978 I wore a cotton string vest under a wool or cotton shirt. Later in 1978 I discovered Helly Hansen Lifa Supa polypropylene underwear, which I would argue was at least as smelly as Damart (which I did try after reading Hamish's Mountain Walk). On the Land's End to John O'Groats walk I also had one of the first Gore-Tex jackets - a Berghaus Mistral. It worked fine during that walk but on a trip that autumn in the Lakes it failed completely and I got soaked. That was first generation Gore-Tex, which was extremely breathable but clogged easily with dirt and body oil. Second generation Gore-Tex lasted much longer but was less breathable due to the thin PU layer that protects the membrane. 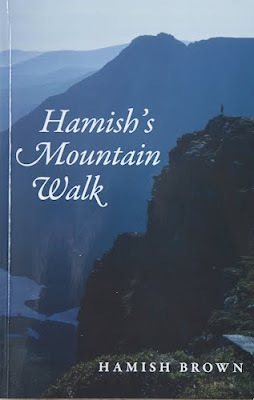 Michiel, I'm afraid I've never heard of such a booklet or of any list of 6,000 summits in Scotland. Does this ring bells with anybody else? Well Chris, a list of summits already is too much credit for some of the bumps that apparently are on the list. As I understood that website any bump that is to some extend bigger than the surroundings was listed, hence my use of the word bump. The website wasn't really about the list however; it only referred to it in regard of a hike to a 'summit' somewhere on the outer Hebrides which wasn't particularly high, but only very distant from the nearest access point and thus required a very long walk in, with many bits of going up and down. Apparently this would require some 11 thousand calories, if memory serves well about 3 thousand calories more than it would require to go up Ben Nevis. PS, this website was called 'Scotland's toughest hill', but using Google I cannot find this website anymore. I always wondered how he avoided tripping over as he worked his way through various paperbacks to avoid the more boring walk-ins. Chris, I think I've seen this website before and though useful, it's not the list I am looking for. It is specifically the caloric rating I am interested in. I mean if you tell your mate you've climbed K2 that sounds pretty impressive. If you would then say you did it from the car park 100 m next to the summit (would there be one) it sounds a lot less impressive. The same goes for a list of hills based on their (sea level) height. Climbing Nevis, being the highest, might be strenuous, but a small insignificant hill somewhere way out North might be much more strenuous because of its remote location. Not just the walk-ins John. He reads along the South Glen Shiel Ridge! I've read while walking but only on wide tracks. I can't imagine doing so on a mountain path. Michiel, the only way any small hill could be much more strenuous than Ben Nevis is if there was a very long walk-in. There are some remote small hills that require long distances to reach but then there are some Munros like that too. The list you are talking about sounds like the Yeamans. The toughest one is considered to be Caiteshal, a not-very-high-but-extremely-awkward hill in Pairc, Lewis. Indeed, while reading further on the website Chris suggested I found reference to Eric Yeaman's book and Caiteshal hill or bump on Lewis, which I think are indeed the book and bump I was looking for. Do you have any idea if the hills in this book are indeed rated with calories or something like that? Amazon UK at least has it in its database (the book, not the hill), but it is unavailable unfortunately. The book is definitely Yeaman's. The hills are 100m prominence or 5km or more away from another hill. This is the forerunner of Dawson's book. The difficulties of the hill were rated in Mars Bars. Caiteseal was the hardest, but it is often done by boat from Scalpay. Pairc is an extremely good backpacking destination as well. Indeed I'm sure it's Yeamen's book. Would like to have a copy and Caiteseal has made its way onto my hiking itinerary. Thanx for the help folks.